Welcome, final month of pregnancy! As I have Mozart tickling my ears and there's a light dusting of powdery snow on the ground outside, with precious baby clothes gifted to us by a small group member strewn all over our couch, I am taking in every moment. I'm taking in this moment - our mini Christmas tree still twinkling , new plants greeting me here and there, the quiet lull of a winter's day. Pregnancy has taught me to take it slow, to show myself grace, to embrace rest, to embrace this season, to brush off comments and to hold onto what's true. The current challenge is to balance holding fast to the present while embracing the impending future, to prepare dutifully for what's to come while remaining in an attitude of gratitude of what's here now. Baby's size: A head of romaine lettuce! Cons: Feeling heavy and super emotional! Outlook on the coming of baby: After a very informative Lamaze class, I am channeling what was previously nerves and anxiety about labor & delivery into anticipation and excitement to meet baby! Week 36 was spent soaking up quality time with my parents, soon-to-be grandma and grandpa! I eased into each day, woken up by the scent of my dad's morning coffee lingering in the air. 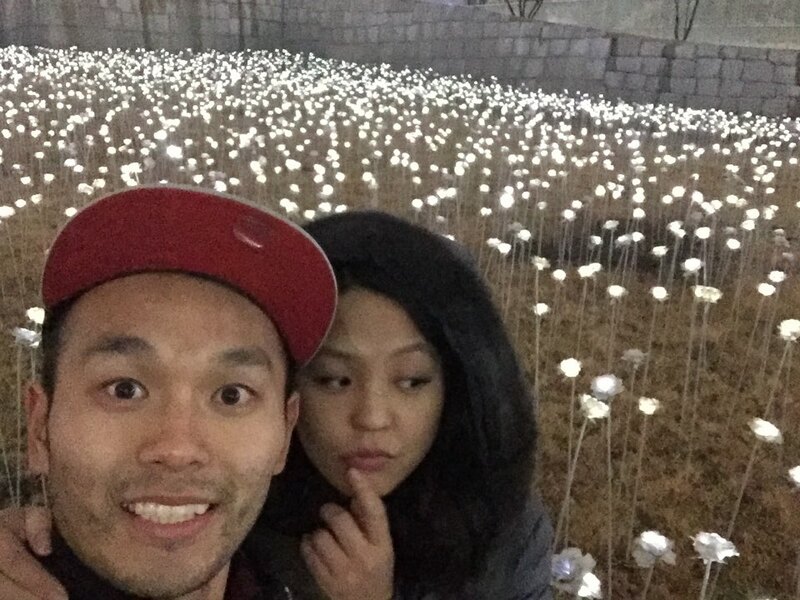 And together, we crossed off our mutual "Family Christmas to-do" list: a Handel Messiah concert, a trip to Gwangjang Market for warm and toasty Korean comfort food, the LED flower show at DDP (Dongdaemun Design Plaza), a Renoir exhibit and a walk through Changdeok Palace where royalty roamed and played and even an impromptu mosey around Yangjae Flower Market. 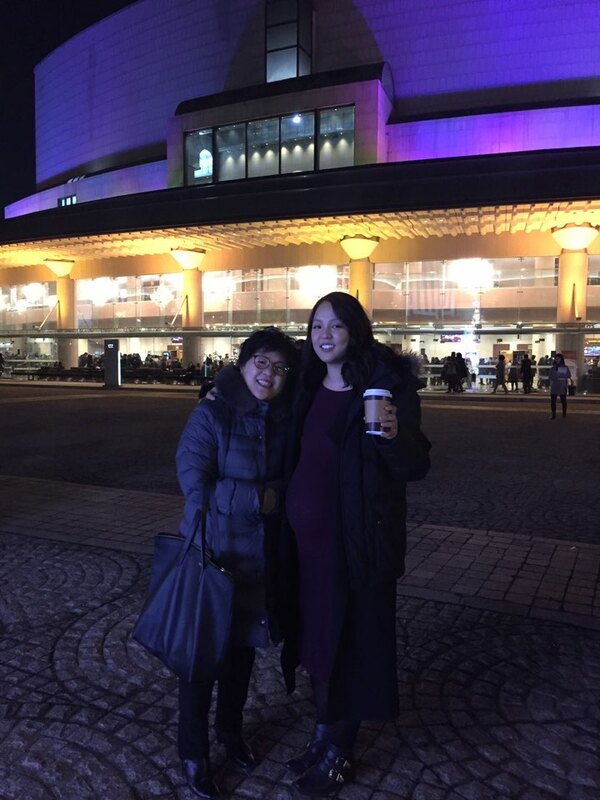 Bebe's second time at 예술의전당 Seoul Art Center - this time for Handel's Messiah with grandma and grandpa! He was having a dance party in my belly throughout the performance! We crossed off my dad's Christmas wish: to walk around the "Secret Garden" at 창덕궁 Changdeok Palace when it snows. It was a Christmas miracle and snowed on that day! Y & I even managed to fit in a breastfeeding class on Christmas Eve. It was hilarious - let's just say it involved the teacher donning a "breast vest" for demonstration purposes. The class taught me a lot and gave me a lot of food for thought to munch on - mainly to communicate with baby, to focus on loving and comforting him, and that baby needs and wants mom most. There was something truly reassuring about these realizations. I hadn't realized I had been focused on the logistics and details of pregnancy/motherhood/breastfeeding but the class helped me take a HUGE~ step back and to look at the big picture. We wrapped up Christmas weekend with the most exquisite Ugly Sweater Potluck Party at Le Garden hosted by the loveliest. There were homemade dishes, desserts, photo shoots, a friendly yet competitive round of White Elephant and a mix of the goofy, the serious and sincere. All in all, the best kind of night with beautiful people. With Asian Santa! Just a side note: My husband takes the "ugly" part of the ugly sweater party very seriously, my faux fur vest (not shown) made it into his OOTN. Christmas evening was spent napping on the couch to recharge to end the night with the first friends Y & I made here in Seoul - a special group of people indeed. Over chicken and beer (water for me) we laughed until our stomachs hurt, making the most of our time together. We parted saying our goodbyes and good lucks as it would be the last time this said group would be altogether for a while. Much will have changed in a few months' time when we're reunited. This week, my emotional bandwidth was screaming, "Overload! That's enough!" I found myself overwhelmed by not only my emotions but the emotions of others, and not just "others" but those near and dear to my heart. My gut instinct is to retreat, check out, tune off, to veg out and often overdose on mindless YouTube videos. But I'm thankful I am not left to my own devices. Being surrounded by a community, near and far, to walk with, to talk with, to do life with has helped me to share and not hold in, to process and confront, not avoid. And like that, I have had chance encounters and conversations where thoughts and feelings are mirrored, empathy is present and my bandwidth increases. I'm thankful for this "place of grace", where I can take in, observe, process, share, embrace. Happy Friday! I hope you can take time to process, share and embrace. 3D glasses at Gyeongbok Palace. That's how we roll. Since moving here, I've got to thinking a lot about friendship- it's a wonderful thing, a gift, a treasure to be held and cherished. I've been thinking about my friendships, near and far. "Distance makes the heart grow fonder" for those friends that are far away. (And I'm thankful for technology- social media, FaceTime, Kakao). And those nearby, I am thankful for their company, their presence, the day-to-day things, the buffet dinners, the conversations over coffee, the lounging and watching basketball games. Our lovely friends, S & I recently had a beautiful baby boy D. He can stare you down like a boss, his eyebrow game is strong, and he's full of smiles and giggles and rolls. Friends nearby got together to celebrate this precious life. In the usual "S. I. G. Y" fashion, we kicked off the celebration with a buffet - shabu shabu! After stuffing our faces with food (evidence clearly indicated from the photo above), we headed over to S & I's place for cake, ice cream and the Warriors game. A fabulous ending to a fabulous evening. I made party hats for the festivities and tortured Baby D and my friends with them. Happy 100 days! You bring us all so much joy and you are so precious to us. And thank you for always being such a good sport so that Uncle Y and Aunt G can hang out with your mommy and daddy! We love you! Itaewon seems to be "our spot" here in Seoul. For a multitude of reasons (including but not limited to restaurants, shopping, Ben's Cookies, chiropractor), I find myself there time and time again. But hey, I'm not complaining. With a few friends, Y and I decided to check out Southside Parlor. And are we glad we did! Their cocktails are tasty and unique, a concoction of distinct flavors. And their sandwiches and tacos are mouthwatering- a special plug for their pulled pork sandwich! We also recently went to Craftworks, a home of craft-brewed beers named after the mountains of Korea! Y & I had a lunch date the following day at Buddha's Belly, a Thai restaurant. The sun was out and we enjoyed our pad thai, pad see yew and Thai iced tea by the wide-open windows. We soaked in some much needed vitamin D and reminisced of our lunch dates in Manhattan. Thank you, Itaewon for your eclectic cuisine and for giving us a taste of "home" when we miss it. My friend K is a teacher, one who loves her students lavishly. Her exuberance for life is intoxicating and I always leave her presence feeling energized and refreshed. What is great is that she has Wednesday afternoons free so I have dates with K on Wednesdays. We decided we would use our Wednesday afternoons for adventures. Welcome to a new weekly series: Wednesday Wanderings! Yesterday, with the 60 degree weather and the sun shining bright, we decided to head out to Samcheongdong for lunch and meanderings. I couldn't believe I could actually leave the house without a jacket. My sunglasses became mandatory to avoid the squinting and scrunching. 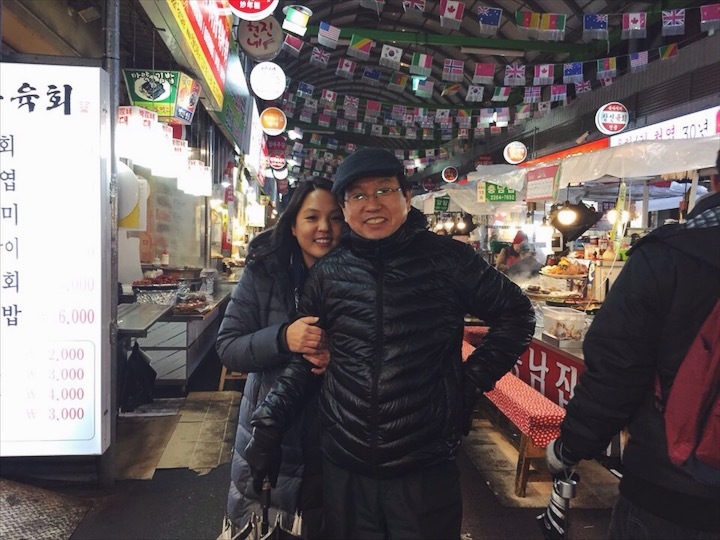 We strolled around the quaint area of Samcheongdong, its streets lined with restaurants and small shops filled with knick knacks and jewelry. Our first spontaneous stop was for ddukggochi, rice cakes on a stick. It was a scrumptious and glorious mess but well worth it (and well worth the 700 won price, equivalent to about 70 cents!) Its crispy, spicy and saucy exterior and chewy inside, I could eat them all day. After a bit more walking, we worked back up our appetites for lunch, which was soojaebi and pa-jun. We popped in and out of shops, K and I got matching rings and made our way to one of her favorite spots, a cafe with a rooftop. I enjoyed a cup of caramel macchiato, we soaked in the sun rays and basked in its warmth and the tranquil surroundings. Our conversations were filled with reflections, words of encouragement and a rolling anticipation for future things. We wrapped up our date with a stop at a nearby bakery to pick up some tasty delights for the road. My choices: an apple strudel, a chicken and onion flatbread sandwich, and an olive roll for Y.